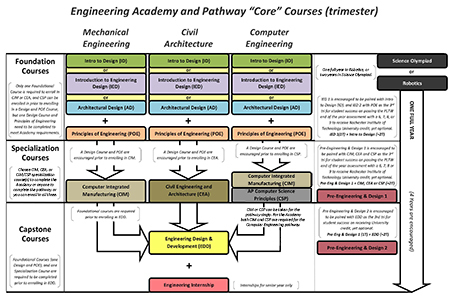 Overview: The graphic below lists all courses which are part of the Engineering Academy / Pathway programs. The courses are arranged in the sequence in which they should be taken in order to meet prerequisites (i.e. a student needs to complete a Design Course (IED or ID or AD) or POE before enrolling in Computer Integrated Manufacturing (CIM), Civil Engineering and Architecture (CEA), or AP Computer Science Principles (CSP)), then the capstone. The courses listed are considered to be Engineering Academy “Core” courses and are specifically designed for pre-engineering high school students. These courses can be taken by both Engineering Academy and Pathway students with a focus in Mechanical Engineering, Civil Architecture, or Computer Engineering. Click on image to see larger and scroll down to create your plan. Pre-Engineering & Design is also known as Engineering Fabrication. Note College Credit: All Engineering Academy and Pathway courses are dual College/University enrollment through PLTW for college credit with Rochester Institute of Technology. The foundational courses are also articulated with Palomar College. Students can earn transferable college credit through these institutions toward their engineering major. See College Credit. It is recommended that students meet with their counselor to establish a 4-Year plan that meets their academic goals. Students and parents can design their own track working with the school counselor. Three Plans: The graphic below lists three directions a student can pursue in planning their four years of high school to meet Engineering Academy / Pathway requirements. Plan One allows the student to develop their own plan from the list of Engineering “Core” academic courses. 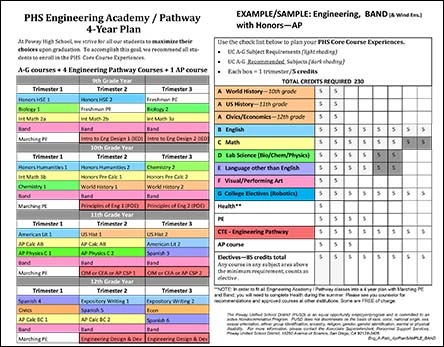 Plan Two is to schedule courses during the students four years of high school to complete Engineering Academy “Core” courses in conjunction with high school graduation requirements, and Plan 3 embeds Engineering Academy “Core” courses, high school graduation requirements, and Honors/AP courses together. Students should follow one of these plans. 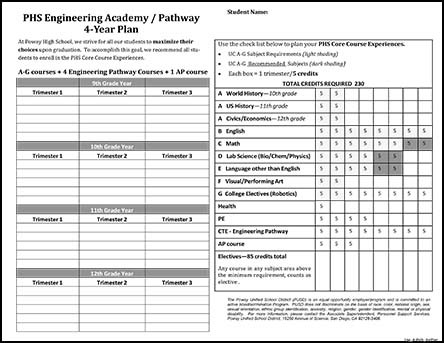 Plan One - Academy / Pathway where the student designs their own plan: Complete the following educational plan of subject courses by year and trimester. Please consult the course sequence charts, course catalogue, graduation requirements and college entrance requirements as you complete your plan. 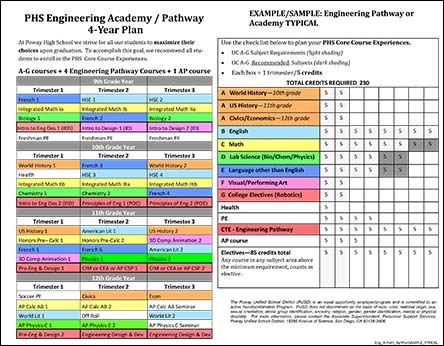 Click on the Engineering Academy / Pathway 4 year plan below to help you plan the next 4 years. 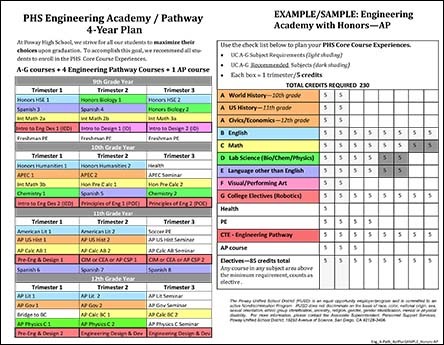 Plan Two - Engineering Academy “Core” with course graduation requirements: Remember, a total of four courses, an internship and one year of (after school) Robotics or Science Olympiad are required for each Engineering Academy student. 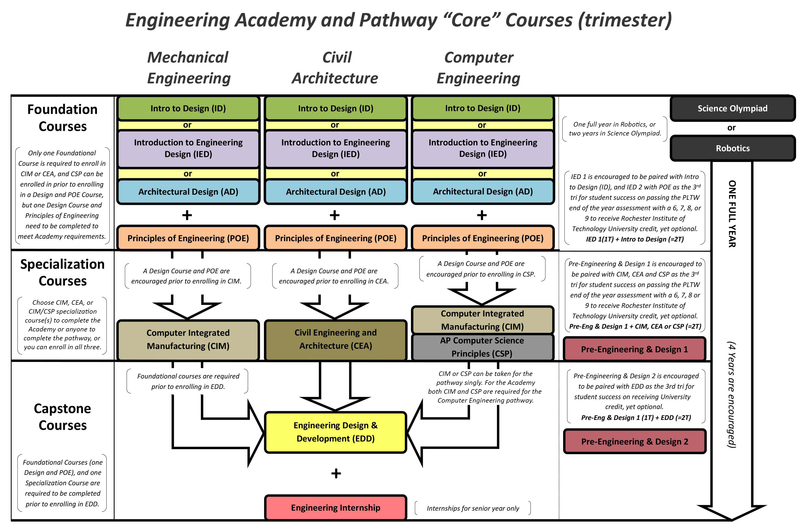 It is encouraged that you review the graphic above, Engineering Academy and Pathway "Core" Courses (trimester) overview and design a plan where your foundational courses are completed as early as possible (preferably starting in your freshman year, but not required). Plan to complete your Specialization Course during your junior year and the Capstone/Internship in your senior year, but any plan that meets the requirements will work. Create your plan, then confirm with parents/counselors.